Queensland Independent school footy kicks off next week with the GPS Schools’ Division of the Queensland Independent Schools Cup in Brisbane. Five divisions will be contested over six weeks between Anglican Church Grammar School, Brisbane Boys’ College, Brisbane State High School and St Joseph’s Nudgee College. First XVIII, Second XVIII and Year 10 matches will be played on Wednesday afternoons, with Year 8 and Year 9 divisions played Friday afternoons. All games will be split between Yeronga and Zillmere. The season will open with the annual Foundation Cup (First XVIII Grand Final replay) at Zillmere on Wednesday 30th April, with the season culminating in a carnival-style Grand Final Night on Friday 30th May at Yeronga with each division’s grand finals. The Term Two division, started in 2011, was created due to a change in the GPS Sporting calendar. GPS Schools traditionally played in the Term Three Independent Schools competition however due to the clash with rugby, a new competition was created to cater for schools affected. Nudgee will be out to defend their First XVIII and Year 10 titles, after a very successful 2013 season, and will face BBC in a Round One double header from 4:15pm at Zillmere, while at Yeronga the boys from State High take on Churchie at 5:15pm with the Second XVIII BBC v Nudgee White match as a curtain raiser at 4:15pm. 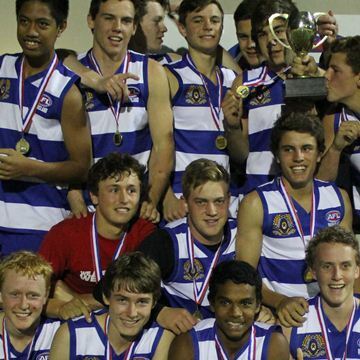 The 2014 QISAFL GPS draw, ladder and results can be viewed by clicking SCHOOL then FIXTURES & RESULTS.